Today’s guest blogger is Andy Roth, who was interviewed by Collectors Weekly in June of 2010. Andy can be reached at andyroth@comcast.net. 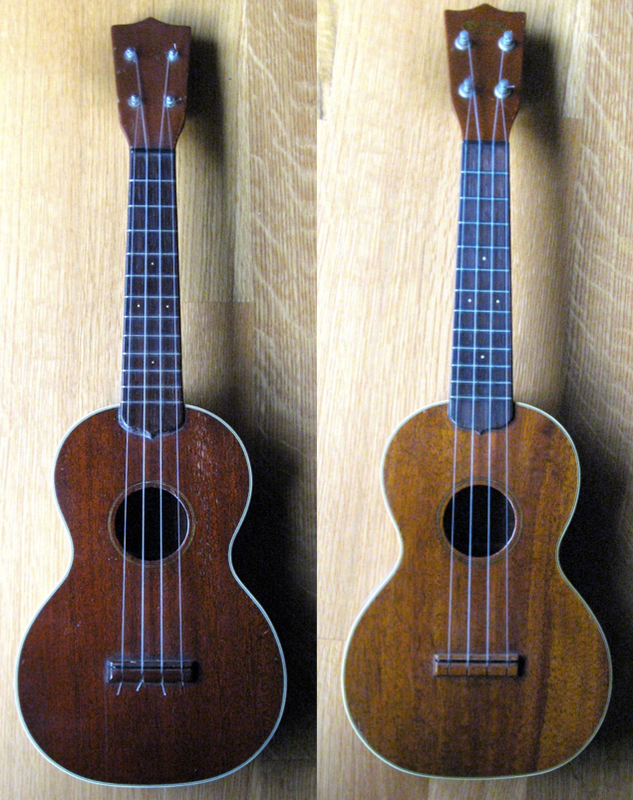 The C. F. Martin “Concert” sized ukuleles were first cataloged and priced in 1925 and remained in production until 1965. With few exceptions, these ukuleles were made of mahogany and had their fronts bound in rosewood, later to be replaced by faux tortoiseshell celluloid binding. By special order however, a handful of instruments came out of Martin’s custom shop in variations to the standard Style 1 Mahogany (1M) Concert. The Martin Style 2M (above, left) is one of the rarest Martin ukuleles in existence. In fact, to my knowledge, and to the knowledge of my ukulele colleagues, this is the only one known. The top is inlaid with black-and-white celluloid binding typical of the style 2M. Given its patent tuning pegs and small fret markers, it probably dates to approximately 1927. One of my favorites, this uke is possibly the best playing and sounding instrument in my collection. The ukulele on the right is the same instrument, but made with koa back, sides, and top, which is why it’s known as the 2K Concert. Again, very few of these were made and only a handful are known to still survive. This one has a C. F. Martin decal on the front of the headstock, indicating that it was likely made near or later than the mid-1930’s, when the brand transitioned from the imprinted Martin name stamped on the back of the headstock to the gold colored decal on the front of the headstock commonly seen today. My guess is this instrument dates to the 1950s, during the second great wave of the instrument’s popularity (the first one was in the 1920s), which can be attributed, in no small part, to Arthur Godfrey, who regularly played the ukulele on his radio and television shows. My first ukulele was a mail order from Sears in the late 1940s, but it was crushed when someone sat on it during a group trip on a school bus. Later, in 1961, when I lived briefly in Alabama with Farm Journal magazine, I accidentally discovered the wonderful world of quality ukuleles at Art’s Music Store in Montgomery. There, in the window was a Martin Concert model and I walked inside to try it out. When I came out, I had the instrument in my hand and my wallet was $55 lighter, but I still play it today. It is a wonderful instrument, and will eventually belong to my granddaughter. I later bought a second Martin Concert ukulele, but traded it for a Martin 5-17-T which I string and play as a baritone ukulele and the larger body gives it a deeper more mellow sound that I love, but I really wish I had kept the second Martin Concert model. “ ” Markoff’s book arrives at an important moment in the humans-versus-robots debate.